The White Balance Strip and Controller both run on 12V DC and can be powered by either a 12V hard-wired driver or a plug-in 12V adapter. The Wall Controller fits into a standard light switch wall outlet and has two lead wires to connect to 12V DC power. “Like many of our custom, in-house products, the White Balance LED Strip has been designed by Elemental LED for a high color rendering index (CRI) and high efficiency. We designed the controller to mate perfectly with the strip light for smooth fading in different applications,” says Martin. The Wall Controller can be adapted for RGB color-changing LED applications because, like RGB LED strip lights, the White Balance LED Strip Light utilizes three channels. 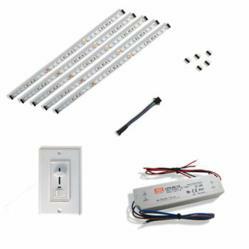 Elemental LED is offering the White Balance LED Strip Light, Wall Controller and custom connectors in several discounted kits. With the White Balance Expandable Kit, customers can choose how many feet of strip light they need and receive the first foot for free. The White Balance 5-foot, 10-foot and 15-foot Kits also come with a 12V driver at no additional cost.